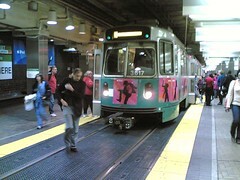 Boston Metblogs » What is wrong with this picture? Might the concept of a man walking across the tracks in front of a train be a little bit odd? Might that be a wee-bit dangerous? Might the planners of Boston’s T thought that one out better? Looking at this photo, I see lawsuits, I see ADA non-compliance. I see all kinds of tram plus people = accidents. I see bad planning. Here’s the big question though: Do I see the normal MBTA? Is it that safety ignorant? Please do tell! The train is stopped. This must be Park St. You are allowed to cross when the train is letting people on and off. There’s nothing wrong with that picture. Streetcars and pedestrians/riders coexist perfectly happily in most of the world without somebody constantly raising safety and litigation issues. Only in the US are we so obsessed with this issue that planning anything becomes a long, painful process that constantly includes lawsuits which then further delay anything. It’s amazing anything gets built/operated these days. Yes, safety is important, but not every accident is preventable (by sheer definition of the word) and instead of trying to insulate people from everyday danger, we’d be better off making them accountable for their own actions. So, don’t cross in front of the streetcar if you feel it’s unsafe (and certainly not if it’s moving). That should be common sense.